"I work at Eastern Michigan University, located in Ypsilanti. Up until the 1950s we were Michigan State Normal College and were primarily a teacher training school. A couple of years back I put together a video on the school's history and in the course of my research found that one of our alumni was a WASP and I've been kind of intrigued by her ever since. "When I did our history video I got particularily engrossed in the WWII era. We were a pretty small school and the emotion of it all really seemed to resonate through the things I read through. "When I was doing my research for the video I was going through a file with service photos of our students and alums who were in the war. I came across Janis' WASP graduation photo attached to a copy of the press release. 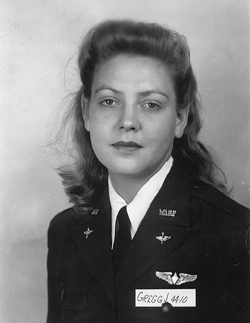 * I would have used the photo in my video but just glossed over her as another alum in the service--except the night before I had watched the PBS special on the WASP so I actually knew what it was all about. 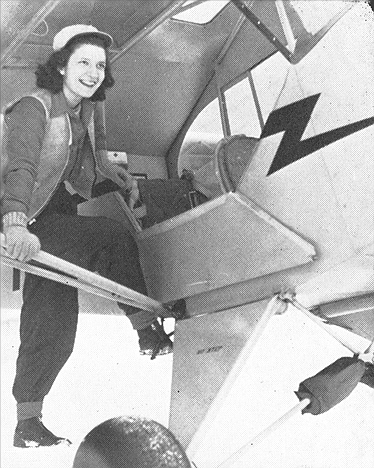 "Though she may have never flown a mission, that she was one of the few to make the grade is still, to me, quite an achievement. The little bit of background I have on her tells me she came from an area of Michigan that to this day is very rural and very agricultural. Her home address was Route #1. I suppose that her story is one of a girl who came from a small farming community to the little teachers' college in a small but robust (and larger) town, graduated to work in the big city (Detroit), and then was drawn away to California by the allure of the WASP. It's probably the type of story a lot of the WASP share and I find it quite intriguing. "I started looking for Janis again after mentioning her to a couple of professors in our Technology department. We have a program here that focuses on the interaction of people with technology and how technology influences our culture. Right away they saw this as the story of someone whose life was significantly impacted by what, at the time, was still an emerging technology. "The two profs who I talked to were quite interested, though I'm not sure what they might do with this. One teaches our History of Technology classes and is keen on women's issues and this seems relly perfect for her. My boss would like to see an article done for our alumni magazine, which I think would be great. "... why I'm doing this---I guess I just love the history of this place. Though we have tens of thousands of alums with tens of thousands of stories, this is one I know about and I think would interest people, and I'd like people to know about it. It's not exactly part of my job to do this stuff, I just think it's interesting and good for the school. And without knowing Janis Gregg Wheatly, it might be kind of neat for her to know that there are people back in the old home state who know who she is and have some regard for what she accomplished in a very trying and different era." NOTE: Because the WASP were disbanded on December 20, 1944 shortly after the graduation of this class on December 7. 1944, none of these graduates were assigned to a duty station.